Wednesday April 24th, WASHINGTON, D.C.
A DIVERSE coterie of journalists, academics, and policy professionals, including two Congressmen, two current Ambassadors, three former United States Ambassadors, and one US Senator, convened at the Willard Intercontinental Hotel in Washington D.C., to celebrate the first inaugural dinner of the South Asia Journal. The Publisher of the magazine presented Senator Robert Casey Jr. of Pennsylvania with a Distinguished Service Award at the dinner for his involvement in South Asian Affairs. In addition to the award ceremony, the dinner featured several speakers, including former Ambassador William De Pree, who served as master of ceremonies, the magazine’s publisher Ghulam Suhrawardi, former US Ambassador to Fiji Osman Siddique, Senator Casey, and the evening’s keynote speaker, former Assistant Secretary of State for Legal Affairs, Richard Verma. 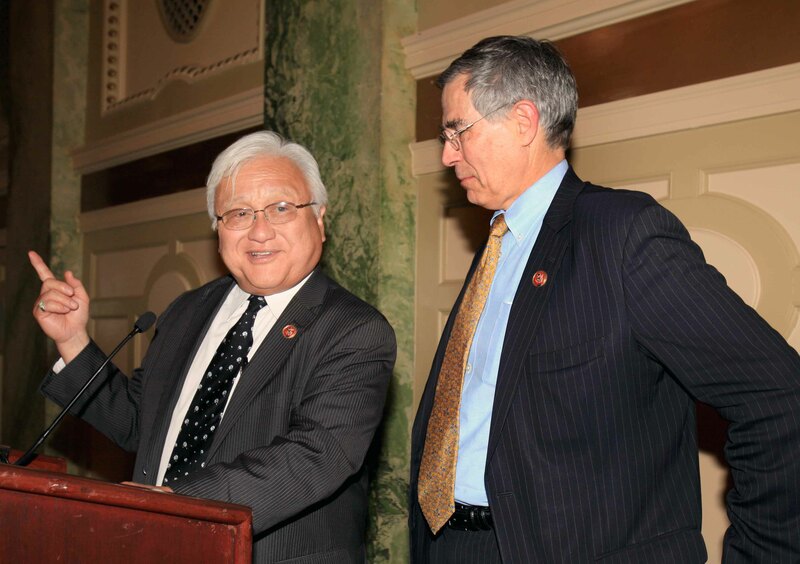 Congressmen Rush Holt (D, NJ) and Mike Honda (D, California) were also in attendance, and addressed the guests with impromptu remarks of support for the magazine at the end of the evening. The South Asia Journal is a quarterly publication based out of Parlin, NJ. Founded in 2011, the journal focuses on policy and development issues in the South Asia region, with an eye to an American audience. It has received contributions from Dr. Muhammad Yunus and Former Ambassador Howard Schaffer, amongst others, and maintains a web presence at www.southasiajournal.net. The gala event was held in the Willard Hotel’s ornate ‘Crystal Room’, and organized by the Journal. The dinner was well attended with the room filled to near capacity. In addition to honoring the Senator, members of the journal’s advisory board and staff were recognized for their efforts. The two active Ambassadors in attendance, Ambassador Shankar Sharma from Nepal and Ambassador Ahmad Sareer from the Maldives, were also asked to stand and be acknowledged during the proceedings. “I’m humbled and honored to be accepting this award tonight. My wife Theresa, if she were here, would not believe that I’d be receiving an honor like this at the Willard. This is a pretty fancy place,” he said to some laughter. Former Assistant Secretary Richard Verma keynote address was the longest and most engaging speech of the evening, artfully weaving together the immigrant stories of his parents, who are from India, into his own life story. His speech was filled with revealing anecdotes and well-timed humor, and he was able to balance optimistic appraisals of the region with realist assessments of its problems. Former Assistant Secretary of State Richard Verma addressing a captive crowd at the SAJ Inaugural Dinner in Washington, DC. While commending the hard work of the magazine, noting that their efforts could not be “more timely” Secretary Verma challenged the journal directly to not forget the human stories that comprise the essence of the South Asian experience, and to strive to include personal narratives amongst their more standard focus on geo-strategic policy and economics. The event drew over 100 attendees, who each received a complimentary copy of South Asia Journal’s Spring Issue. For more information about South Asia Journal, visit the magazine’s website at www.southasiajournal.net, or follow the publication on Facebook and Twitter.